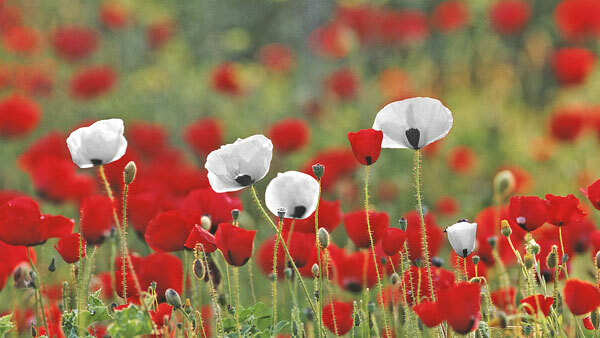 The white poppy was first introduced in Britain in 1933, only 12 years after the red poppy. Alarmed by the rising tide of post-war militarism, British women, many of whom were the wives, mothers and sisters of men who had been killed – looked for a symbol to express their belief that civilized nations should never again resort to the terrible and ineffectual method of war for the settlement of international disputes. The wearing of a white poppy on Armistice Day became a focus for the British peace movement and the newly founded Peace Pledge Union undertook its promotion and distribution. The growing demand for peace poppies highlighted the need for Remembrance Day activities to reflect the diversity of Canadian perspectives on war and remembrance and to acknowledge the war experiences of many immigrant Canadians. With this in mind, Vancouver Peace Poppies partnered with The BC Humanist Association in 2016 to co-host “Let Peace be Their Memorial,” a Remembrance Day wreath-laying ceremony to commemorate refugees and other overlooked victims of war. The following is largely excerpted from my address at the 2016 ceremony. The first armistice day was in November of 1919, pretty close to 100 years ago, a year after the end of a war so huge and horrible it was regarded by many as “The War to End War.” People thought that surely nothing this terrible could happen again, that governments and nations had learned from this horrific and wasteful experience. But 100 years later, we find there have been well over 300 more wars, with close to 200 million people killed and every year on November 11, we get together and remember. But really, what have we accomplished with all our remembering if 200 million people have died in war since then? Do we really think that was the torch John McCrae and his comrades threw to us? They would be appalled to think they had lost their lives and we had learned so little from it. Around the world, we need to be training hundreds and thousands of people as a mediation resource available to communities and countries to deal with the difficult situations that are always going to happen. Not providing training for peacekeeping forces or the military or the police. We need to commit ourselves to counting all the different costs of military conflict: the social costs, the environmental costs, the desperate refugees, the lost potential of 50 million children whose schooling is disrupted by war, the women traumatized, abducted or sexually assaulted, the conscientious objectors who sometimes pay with their lives for standing up and refusing to fight, the psychological costs of PTSD on veterans and civilians. We need to include all those things and we owe it not just to ourselves to do so; I would say we even owe it to our military. If we ask somebody to risk not just their physical health, but also their mental health, on a military endeavour, we’d better be sure it’s likely to succeed and that in the cost-benefit analysis, it’s worth the costs. So I don’t see any disrespect to the military in saying, “Let’s count all the costs of war and evaluate if it’s really going to achieve what we want to achieve.” If we don’t do that and find a better way, we will really have ‘broken faith’ with those who died and with those who will continue to die. commemorate all victims of war. mourn the environmental devastation it causes. reject war as a tool for social change. call for dialogue and peaceful conflict resolution. show your commitment to building a better future. Teresa Gagné is the co-founder of Vancouver Peace Poppies (www.PeacePoppies.ca). White poppies may be ordered on the website. The poppies commemorate civilian victims of war and encourage people to challenge the ‘normalization’ of militarism. NOVEMBER 11: Wreath Ceremony to recognize overlooked victims of War, 2:30-4PM, Seaforth Peace Park, 1st Avenue & Burrard Street, Vancouver.